(York, Pa., March 29, 2018) - The York Revolution continue to add to their 2018 roster with the signings of returning infielder/outfielder Rubi Silva and right-handed pitchers Nick Baker and Jeremy Holcombe. The signings were unveiled by manager Mark Mason live on Tuesday night’s episode of “Revs Hot Stove Weekly presented by Shipley Energy” on SportsRadio 1350 WOYK. Silva returns after joining the Revs last September for the stretch run. In seven regular season games, Silva hit .379 (11-for-29) with a home run, triple, and double each, and four RBI. He then hit a sizzling .452 in seven postseason games with 14 hits in 31 at-bats, scored seven runs, and went 4-for-4 in the clinching game against Long Island to fuel York’s championship run. Silva previously spent five seasons in the Chicago Cubs’ minor league system, reaching Triple-A Iowa in 2015, where he hit .282 with 11 HR and 48 RBI in 98 games. 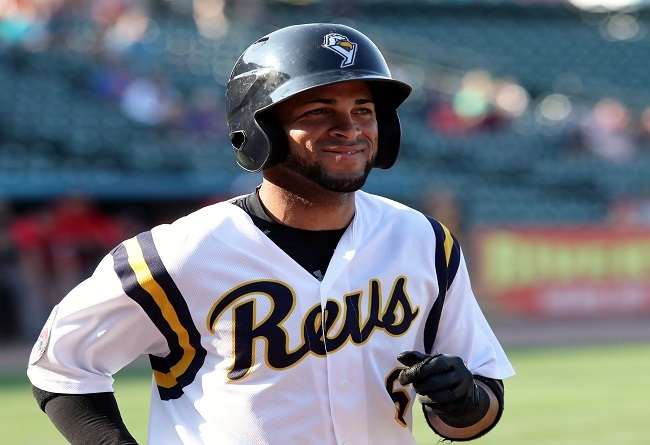 Silva hit .305 in 98 games with Sussex County in the Canadian-American Association in 2017 before being traded to York. The Cuba native can play both infield and outfield and looks to be a key piece to the Revs once again because of his versatility. “He’s an outfielder by trade and played a fantastic second base for us last season. He made some unbelievable plays going to his left, in the whole, up the middle, laying out for balls, and offensively he was like a magician sometimes. Those kind of players are really fun to have on your team because they bring a lot to the table. He’s a guy that can put it in play, get on base and do some damage, and defensively he’s going to help you no matter where you put him, and that just makes life easier when you’re working with your roster,” Mason said. Baker comes to York after spending the last four seasons in the Arizona Diamondbacks farm system, going 18-8 with a 3.55 ERA in 136 games (19 starts). The right-hander logged at least 56 innings of work in all four seasons and has thrown 291.1 total innings in his professional career. A product of California State University Chico, Baker started his career in Low-A in 2014 before dominating with a 10-1 record with 59 strikeouts at Single-A Kane County in 2015. In 2016 and 2017, Baker mainly pitched at High-A Visalia and also made three combined appearances for Triple-A Reno. Baker was selected in the 29th round of the 2014 MLB Draft by the Diamondbacks. Holcombe comes into camp with three professional seasons under his belt. He spent the 2017 season in the United Shore Professional Baseball League with the Westside Woolly Mammoths, posting a 7-3 record with a 2.68 ERA. He totaled 78 strikeouts over 94.0 innings in 17 games and worked eight shutout innings with six strikeouts in a playoff game and got the win. In 2015 and 2016, Holcombe pitched for the Washington WildThings and Normal CornBelters of the Frontier League. The right-hander combined to make 16 appearances, including six starts, and throw 42.0 innings with Washington and Normal. Holcombe played his college ball at Faulkner University. The Revs now have 24 players under contract for the 2018 season and will unveil additional signings on the next episode of “Revs Hot Stove Weekly presented by Shipley Energy” on Tuesday, April 3, at 6 p.m. on SportsRadio 1350 WOYK and www.woyk1350.com. The York Revolution Professional Baseball Club is a member of the Atlantic League of Professional Baseball. The Revolution were Atlantic League Champions in 2010, 2011, and 2017. The 2018 season will be the team’s 12th. Located at 5 Brooks Robinson Way, PeoplesBank Park hosts all 72 home games, in addition to myriad events through the entire calendar year. For tickets or more information, please call 717-801-HITS (4487) or visit the Revolution online at www.YorkRevolution.com.